A beautiful addition to any home or office space, the stunning Aquience Cube 650 aquarium features Aqua One's award winning Aquis CF-1000 Canister Filter, along with twin T8 lighting. The result is an easy to maintain, great looking aquarium with great build quality and stunning looks. Keep your Aquience Cube 650 aquarium in perfect condition with a full range of spares from Aqua One. We have all necessary canister filter spares and media, lighting tubes, heaters, decor and much more... No one cares more about your aquarium than Aqua One and Aquarium Parts. A complete replacement light unit to suit the Aquience 650 cube aquarium. Accepts 2 x T8 flourescent tubes (not included). Finished in black. The Aquience Cube 650 uses Aqua One's very capable Aquis 1000 Canister Filter which means that maintanence is both easy and reasonably infrequent. We recommend changing the wool pads once a month, rinsing the filter foams im a little aquarium water at the same time and exchanging these every 6 months as they deteriorate over this period. 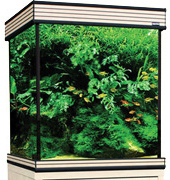 If you need any help regarding your Aquience Cube 650 aquarium or it's maintenance please don't hesitate to contact us.